So when you dig down the preferences or resources of macOS system, you’ll meet plist files. darfink’s vim-plist plugin handles *.plist files quite well. A plist file is in one of three formats; json, binary, xml. macOS is bundled with the plutil command that can convert a plist file from one format to another. The plugin also uses plutil to handle read and write of plist files. The plugin registers autocmd for BufReadCmd and FileReadCmd to read *.plist files, BufWriteCmd and FileWriteCmd to write *.plist files. BufRead and BufWrite events are triggered after reading the file into the buffer, but BufReadCmd and BufWriteCmd events are triggered before reading the file, and that autocmd should handle actual read and write operation of that file. These differences make handling plist files more complex. Overall, the plugin is quite useful and seamless. But recently, I found some *.strings plist files under /System/Library, almost of them in binary formats. The plugin registers autocmds only for *.plist files, so there is no chance to convert them to readable formats. At first, I’ve considered to register an autocmd for *.strings file, but I’m not sure about that .strings extension is only used for plist file, and also there can be other extensions with plist contents (for example, *.nib files are plist, too). darfink’s vim-plist checks g:plist_save_format and b:plist_save_format before writing to plist files. The buffer-local variable is set when the plugin reads the file and detect the format. The global one is set by user, and overrides buffer-local one. I don’t want the plugin to override the content of plist files with different format, so I haven’t set g:plist_save_format. Then the problem raised. 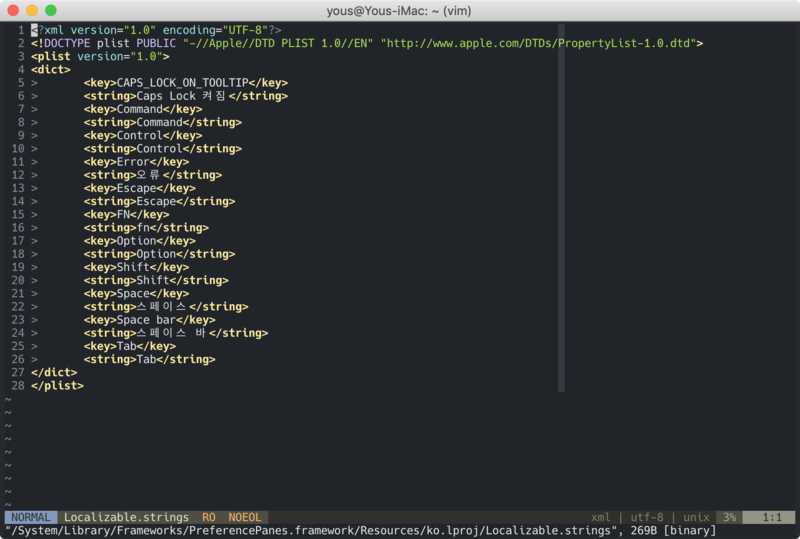 Open a new plist file, like vim test.plist, and save it after editing. Then the plugin didn’t set b:plist_save_format because it’s a new file, and I also didn’t set g:plist_save_format, so the plugin don’t know the format to use for saving. I think this problem can be solved by patching the plugin, but its last commit is pushed in 2014, which makes me use the faster way. Can you see the problem? This makes Vim returns an empty buffer when it reads a file that’s not a binary plist file. As I said above, BufReadCmd should handle actual read and write operation of the file. If it’s not a binary plist file, Vim won’t read anything according to this code. So I changed BufReadCmd to BufRead. 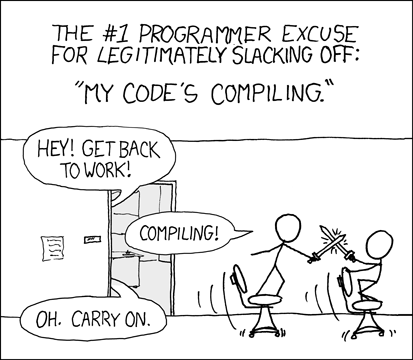 This event happens after reading the file into the buffer, so I have to empty the buffer. The getline(1) reads the first line of the buffer, and we can call it because it’s after reading the file. It’s working quite well, so at that time, I wanted to bring the writing functionality also. Note that the autocmd! line means deleting every other BufWriteCmd and FileWriteCmd autocmds for that buffer, and the second line registers BufWriteCmd and FileWriteCmd for that buffer. <stdin>: Property List error: Unable to convert string to correct encoding / JSON error: JSON text did not start with array or object and option to allow fragments not set. After poking around, I found that the fileencoding is set to latin1. The original file is binary and we just replaced the contents of the buffer, the fileencoding was not properly set. So I just set it to UTF-8. We don’t write binary file by our own hands, so a new plist file would be in xml format. It’s also available on GitHub, you can visit my dotfiles repository! I’m currently managing my dotfiles repository on both of GitHub and Bitbucket. These two repositories are the same, but I don’t want to remove one of them. I mainly use GitHub for hosting code now, but the first place I uploaded my dotfiles to was Bitbucket. I want to keep the HEAD of two remote repositories be the same, so when I push code to my dotfiles, the both of them must be updated at the same time. First, clone or init the repository. Note that there is the url attribute under remote "origin". So we need to run git remote set-url --push <name> <newurl>. Moreover, we need two push URL, so the second command should be git remote set-url --add --push <name> <newurl>. It’s okay to specify --add --push to the first command, too. All done! Note that there are two pushurls under remote "origin". Now git push automatically pushes to the both push remote URLs. (13:38 UTC Saturday): The flag is not in /tmp. Well, you would do ls first when you logged in, so do we. And there was ~/flagReader. If you try completion by pressing Tab key or try to move around using cd, it fails with an error message from rbash. It’s restricted bash, but you can simply run bash to escape. While moving around, we found nothing special without /.flag. Also there were some .s[a-z][a-z] files under /var/tmp/ and /tmp/, created by secretuser. But there are not in fixed location when the problem server was changed, so we thought there would be a way to run Vim under secretuser’s permission. We also tried to find setuid or setgid files, but there was only the previous flagReader.